Trump Administration Sanctions Russia for Spy Attack, After Rebuke From CongressIf Russia doesn’t make changes in 90 days, which is unlikely, U.S. law requires a second, harsher wave of penalties, which would end diplomatic ties. Trump Promises Decision on Military Action Against Syria in Next Two DaysWe may see a repeat of last year’s largely ineffective air strikes. Israel Accused of Bombing Syrian Air Base After U.S. Denies InvolvementThough Trump said there would be a “big price to pay” for Assad’s apparent chemical attack, no country has claimed responsibility for the strike. Trump Attacks Putin by Name for First TimeAll it took was a horrifying chemical weapon attack. Trump Expels 60 Russian Diplomats Over Nerve-Gas AttackIn response to Russia’s alleged poisoning of a former Russian spy in Britain, Trump has shuttered Moscow’s consulate in Seattle. Why Did Syria Still Have Chemical Weapons?An arms-control expert looks at how a 2013 U.N. deal failed, and how Trump’s missile strike flips the calculus in a complex conflict. 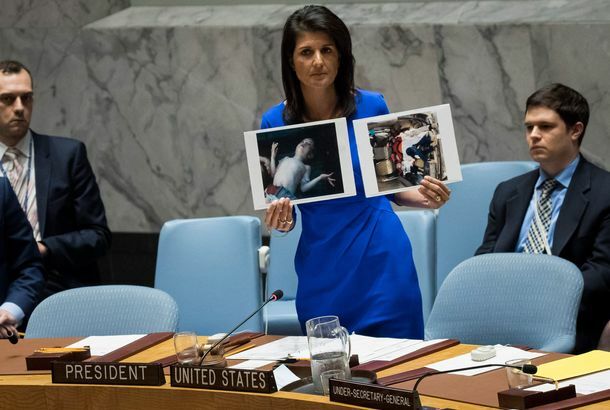 Russia Tries to Blame Syrian Rebels for Chemical Attack As the Death Toll RisesThe United States and Russia will be at odds in the United Nations Security Council meeting Wednesday. DHS Will Test Bioterror Airflow in NYC SubwayNontoxic gases and particles will be released throughout the system this week in order to simulate a terrorist attack using a chemical or biological agent. Iraq Claims ISIS Used Chemical Weapons in AttackThankfully, no one was seriously injured. The United States Will Destroy Syria’s Chemical Weapons at SeaBecause no one else really wants to do it. Experts Aren’t Entirely Convinced That Syria Crossed Obama’s ‘Red Line’Independent inspectors can’t enter the country. U.N. Hears Rebels, Not Syrian Military, Used Nerve GasSo what about that red line?